Lamb has recently gotten into ballet. Her teachers at school said she might have seen some of the older girls doing ballet. She’s also watching Angelina Ballerina, a lot. All the time. 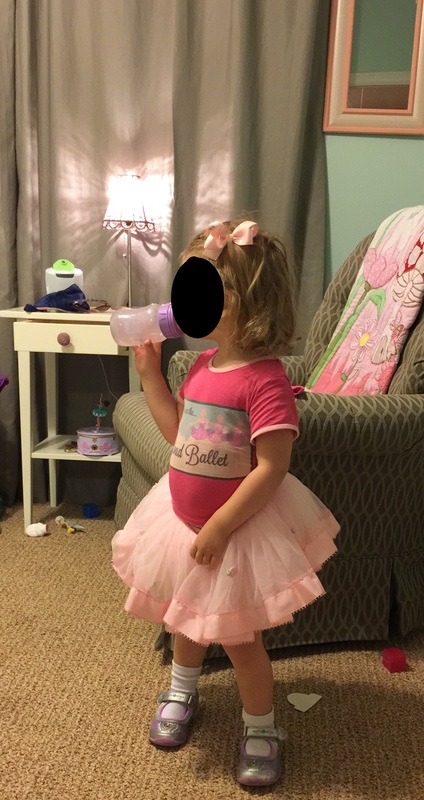 She has a pink tutu that she asks to wear, and then asks me to play “Cinderella” on my phone, which is basically just ballet music. She says “mommy up mommy up!” when she wants me to do ballet with her. These past few nights we’ve been doing ballet together before bed. Fortunately, I took ballet as part of my dance curriculum in high school so I at least remember a few basics. She allows me to give her a “lesson” and she follows along. It’s so cute most of the time that I wish I could video the whole thing. I took her through tendu (ton-doo). She could do it. Sticking one foot out in front of her, then the other. She’d say “toodoo!” Then we went through plie (plee-ay) and she’d crouch down to the floor and back up saying pee-ay pee-ay! I taught her arabesque, which she calls besk. The whole thing is just really cute. It’s kind of exciting to have a little girl who might be in to dance. Those long legs will serve her well in ballet. I took jazz as a little girl and loved it, but I never liked ballet. It always seemed way too stuffy and snotty. So, we’ll see which way she goes. Ballet is a great foundation for all dance though. She can move on to her generation’s version of Madonna afterward.